Tilapias are highly important (and inexpensive) source of fish protein in the world and are one of the most popular species for aquaculture in several regions including the Asia-Pacific. The top 10 producing-countries include China, Egypt, Philippines, Thailand, Indonesia, Lao PDR, Costa Rica, Ecuador, Colombia and Honduras. Since 2009, tilapia aquaculture has been threatened by mass die-offs of farmed fish in Israel and Ecuador. The aetiological agent causing this mass die-offs has been described and identified as a novel Orthomyxo-like (RNA) virus named as Tilapia lake virus (TiLV). This has been reported as a newly emerging virus that causes syncytial hepatitis of tilapia (SHT). As of 2016, countries affected by this emerging disease of tilapia include Israel, Ecuador, Colombia and Egypt. 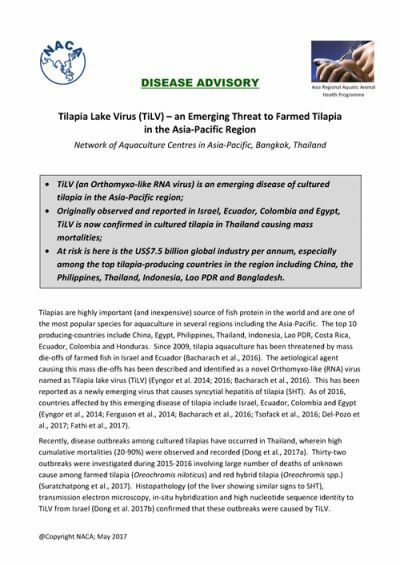 Recently, disease outbreaks among cultured tilapias have occurred in Thailand, wherein high cumulative mortalities (20-90%) were observed and recorded. 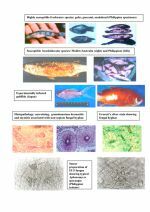 Thirty-two outbreaks were investigated during 2015-2016 involving large number of deaths of unknown cause among farmed tilapia (Oreochromis niloticus) and red hybrid tilapia (Oreochromis spp.). Histopathology (of the liver showing similar signs to SHT), transmission electron microscopy, in-situ hybridisation and high nucleotide sequence identity to TiLV from Israel confirmed that these outbreaks were caused by TiLV.